It was another great year for science, particularly physics, as evidenced by a study conducted by U.K., Canadian and Italian researchers who revealed substantial evidence of a holographic universe. 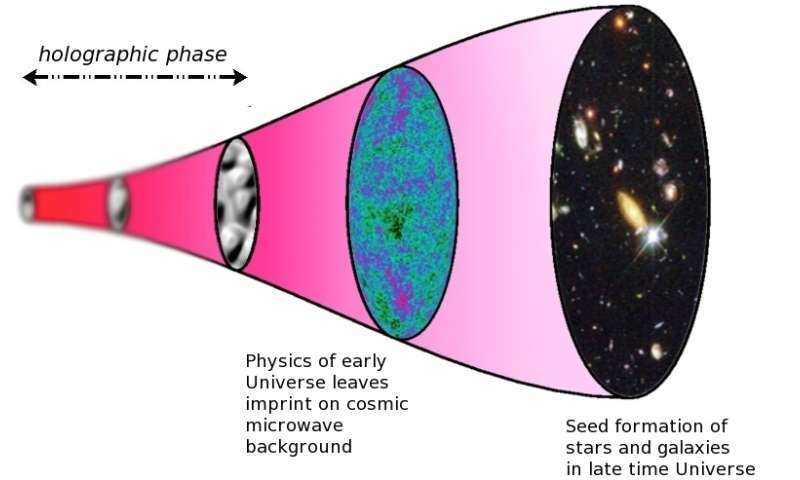 They published what is believed to be the first observational evidence showing that the universe could, in fact, be nothing more than a vast and complex hologram. They came to this conclusion after investigating irregularities in the cosmic microwave background. Also, a team at Harvard announced that metallic hydrogen, once theory, became reality, as they found a way to create one of the rarest materials on the planet. To create the metal, the group squeezed hydrogen at 495 gigapascal forcing the molecules in it to break down and disassociate. They suggested their efforts could lead to answering some fundamental questions regarding the nature of matter. And a team of physicists at Washington State University announced that they had created "negative mass," which, as they noted, behaved in surprising ways, such as accelerating backwards when pushed from a forward direction—it was created by using lasers to cool rubidium atoms to just above absolute zero and could be used to study challenging questions related to the cosmos. Also, a team at the University of Waterloo captured the first 'image' of a dark matter web that connects galaxies. The image was a composite of images gathered using weak gravitational lensing, and has helped confirm predictions that galaxies are tied together by dark matter. It was also a good year for space research, as a team at the University of New Mexico reported on a groundbreaking discovery that confirmed the existence of orbiting supermassive black holes. To confirm the discovery, the team measured the orbital motion between two supermassive black holes, both of which were hundreds of millions of light years from Earth—they used the U.S. based Very Long Baseline Array. The discovery, the team reports, was the culmination of 20 years' worth of work. Also, a trio of researchers at the University of Edinburg dealt a blow to the possibility of colonizing Mars when they announced that their study of salt minerals on the Red planet killed bacteria—suggesting that the Martian surface is "more uninhabitable" than thought." They exposed perchlorates similar to those on Mars to Bacillus subtilis cultures and then bathed them in ultraviolet light, causing the perchlorates to become active, which proved lethal for the bacteria. In more promising news, a team with the International Potato Center conducted studies of their own, announcing that their indicators showed potatoes can grow on Mars. They ran a series of experiments aimed at figuring out if potatoes could grow under the conditions found on Mars—one of which involved planting a tuber in a CubeSat—with positive results. Another involved growing a potato in soil that was considered an analog of soil found on Mars. Meanwhile, another team announced that they had printed bricks from moon dust using the sun's heat. The team working at the DLR German Aerospace Center started with raw material similar to lunar soil, then built a solar furnace to heat it to melt the soil grains—the result was an ink of sorts that could be used to print bricks for structures on the surface of the moon. And two researchers, one with UC Berkeley, the other with the Smithsonian Astrophysical Observatory, announced that they had found new evidence showing that all stars are born in pairs, which suggested that our own sun did as well (going as far back as 4.5 billion years ago). Back in April, Sarah Sadavoy and Steven Stahler reported on the results of creating and running statistical models based on evidence from a recent radio survey of a giant molecular cloud that was filled with relatively newborn stars. It was a good year for technology research, as well, as a team of scientists designed a solar cell that captured nearly all the energy of the solar spectrum—the team, working at George Washington University built a prototype that integrated multiple cells stacked as part of a single device. They report also that it used CPV panels, and was able to convert sunlight directly to electricity with 44.5 percent efficiency, though they acknowledge that it would be very expensive to produce commercially. Also, a team working at MIT announced that they had created a device that pulled water from dry air and was powered only by the sun. The device, the team reported, was made of a metal-organic framework which had been developed at the University of California. The group claimed it could pull water from the air in conditions as low as 20 percent humidity, though it still needed a lot of work to make it capable of absorbing more water. And a team at the University of Sydney claimed to have found a solution to the problem preventing zinc-air batteries from becoming mainstream—the difficulty in recharging them. They reported last summer that they had developed a three-stage method that could revolutionize rechargeability with zinc-air batteries. They claimed that their method could be used to create bifunctional oxygen electro-catalysts for building rechargeable zinc-air batteries from scratch. Also, a team with the Harvard John A. Paulson School of Engineering and Applied Sciences announced last winter that they had developed a long-lasting flow battery that could run for more than a decade with minimum upkeep. It worked, they reported, by storing energy in organic molecules dissolved in neutral pH water, which allowed for the construction of a nontoxic, non-corrosive battery with an exceptionally long lifetime. And a team at the University of Manchester announced that they had created a graphene sieve that could turn seawater into drinking water. The sieve utilized a graphene oxide membrane and was capable of sieving common salts. They reported that they had overcome problems such as membrane swelling with salt water exposure, and also came up with a way to control the pore size more precisely. They also reported that they were working on a way to make the system smaller. In other news, a team at Lund University published the results of a study they conducted regarding the things regular people can do to reduce climate change after finding that the most effective individual steps to tackle climate change weren't being discussed—things like eating a plant-based diet, avoiding air travel, living car-free and having smaller families. They came to these conclusions by studying published papers and government reports, and found that such activities would have far more impact than changing light bulbs or recycling trash. Also, MIT professor Daniel Rothman published a paper claiming that mathematics predicted that by 2100, the oceans could hold enough carbon to launch the sixth mass extermination of species. He reported that he came to this conclusion after analyzing significant changes in the carbon cycle over the last 540 million years, including the five mass extinction events. He identified "thresholds of catastrophe" in the carbon cycle that, if exceeded, would lead to an unstable environment and ultimately, mass extinction. And a study led by Dr. Luca De Siena of the University of Aberdeen with a team from the INGV Osservatorio Vesuviano, the RISSC lab of the University of Naples, and the University of Texas at Austin led to locating a potential magma source in an Italian supervolcano. They described it as the first direct evidence of a so-called "hot zone" feeding a supervolcano. They reported that their evidence suggested that the volcano was nearing eruption. Also, a team with members from Germany and France's European Synchrotron conducted a study surrounding the elements that are included in tattoo ink and found that nanoparticles from tattoos circulate inside the body—the first analytical evidence of the transport of organic and inorganic pigments and toxic element impurities in tattooed tissues, though it is still not clear if their presence causes problems. And a trio of researches, Paolo Bombelli, Christopher Howe and Federica Bertocchini reported finding caterpillars eating shopping bags, suggesting a biodegradable solution to plastic pollution. They reported finding the caterpillars chewing holes through bags by accident, and after a closer look, found the caterpillars were actually consuming and biodegrading the plastic. This, the team suggests, could point to a way to deal with the huge amounts of plastic garbage humans generate. 2017 was a great year in Science and 2018 promises to be even better.